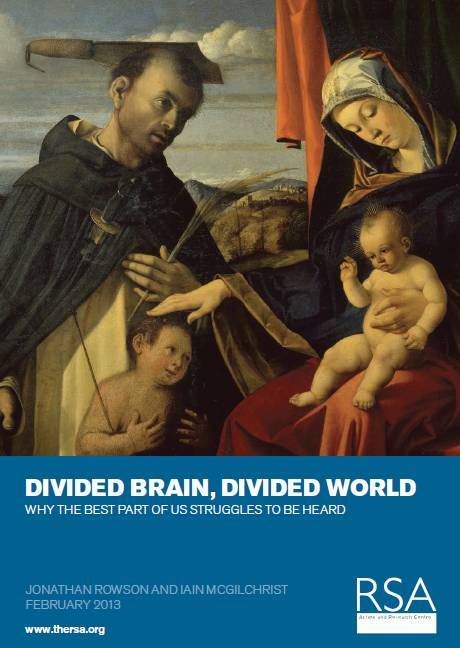 A very big hat tip to the RSA for their latest report Divided Brain, Divided World. It's co-authored with Iain McGilchrist whose book - The Master & His Emissary - is reckoned by many (including me) to be one of the most original and insightful works of non-fiction in the past ten years. There have been over a million views of the RSA's animation about the book, which gives you some indication of its appeal. Nice post. Before finalizing your insurance policy educate yourself about it turbulenceahead.com. I came across this site, it seems to contain very informative and nice information and also gives you an option to compare quotes it In the modern world, many individuals spend money on silver. In contrast to other financial commitment choices, How to buy gold coins are regarded to be immune to economic variations. The investment strategies and money marketplaces usually keep varying and it is becoming more difficult to estimate the value of shares. The silver value on the other hand tends to be more continuous with little variation. This may be the reason why many individuals turn to making an investment in silver as compared to other financial commitment choices.